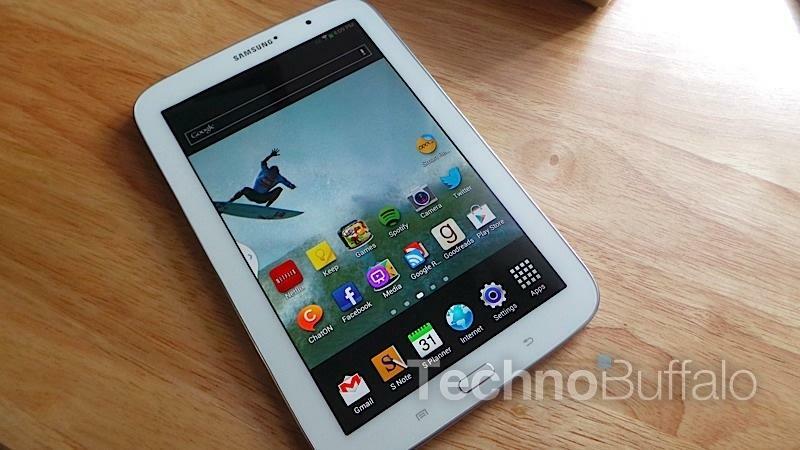 Samsung announced that its Galaxy Note 8.0 will launch in the United States on April 11 for $399.99. The tablet will be available from several retailers, including Amazon, Best Buy/Best Buy Mobile, h.h. gregg, Newegg, P.C. Richard & Son, Staples and TigerDirect.com. As we noted in our unboxing video, the Galaxy Note 8.0 is equipped with a 1.6GHz quad-core processor, Android 4.1.2 Jelly Bean, Samsung's note-taking software and S Pen, 2GB of RAM, 16GB of storage (at the entry-level $400 price), a microSD card slot for adding up to 64GB of additional storage, an IR blaster, an 8-inch display a 5-megapixel camera capable of capturing 1080p HD video and a 1.3-megapixel front-facing camera for video chat. Samsung said the Galaxy Note 8.0 will also include 50GB of free Dropbox storage for two years, a $25 Google Play gift card (requires registration with Samsung) and a year of unlimited access to Samsung Music Hub. We'll be bringing you our full review after a few more days with the device, so stay tuned for plenty of additional information. RIDGEFIELD PARK, N.J. – April 9, 2013 – Samsung Electronics America, Inc. today announces that the Galaxy Note 8.0 is coming to the U.S. market on April 11.Unveiled globally at Mobile World Congress in February, the Galaxy Note 8.0 will be available in stores and online at retailers including Amazon, Best Buy/Best Buy Mobile, h.h. gregg, Newegg, P.C. Richard & Son, Staples and TigerDirect.com. "The Galaxy Note defined an entirely new smartphone category and the Galaxy Note 10.1 tablet redefined the tablet experience for consumers," said Travis Merrill, vice president of Samsung Electronics America, Inc. "With the Galaxy Note 8.0, we fully expect to ignite the mid-size tablet market Samsung pioneered with the first Galaxy Tab. The Galaxy Note 8.0 is small enough to fit in your pocket or purse and packs the power needed for full mobile entertainment and productivity." The Galaxy Note 8.0 will be the first product to feature Samsung WatchON, a new search and recommendation service that alleviates the chore of channel surfing and makes finding TV shows and on-demand video content faster and easier. Samsung WatchON simplifies the process of discovering new content to watch by searching across multiple content sources, such as live TV and streaming video-on-demand sources such as Samsung's Media Hub*, to recommend movies and TV shows. It also provides complementary content including actor bios, reviews and related information. For entertainment on the go, the Galaxy Note 8.0's screen is great for everything from content viewing to reading. With its dazzling 8-inch WXGA screen, the Galaxy Note 8.0 is perfect for watching HD content, packing 1280 by 800 pixels. The Galaxy Note 8.0 also has Reading Mode, which adjusts color and brightness to an optimal level for reading. It provides the ability to customize fonts and themes so select books, magazines, documents and Web pages are easier to read. Combined with Smart Stay, which keeps the screen awake while you are reading, the Galaxy Note 8.0 is customized to ensure the best reading experience. · Multi Window: The Galaxy Note 8.0 offers true PC-like multitasking, so you can use two apps side-by-side. Multi-Window now supports 20 apps, including Polaris Office, Google Chrome and Facebook. · Air View: Conveniently preview your content without opening files or folders. The S Pen held above the screen allows you to preview pictures in the Gallery, open menus on Web sites, and preview a message or an attachment in an email. · AllShare® Play: Pass content to the TV or remotely access files on your desktop computer. · Polaris Office: View, create, and edit Microsoft® Office Word® documents, Excel® spreadsheets and PowerPoint® presentations right on your tablet. With the Galaxy Note 8.0, you can add handwritten notes and drawings to your documents. · Awesome Note: A note-taking application and to do list manager, Awesome Note enables you to customize folder icons, colors, fonts and backgrounds for quick reference and visual organization. · Group Play: Share and collaborate on content, including documents, which allows users to work together. Buyers will enjoy pre-loaded content and services valued at over $200, including 50GB of free Dropbox storage for 2 years***, 1 month free of unlimited music streaming in Samsung's Music Hub, Samsung's Smart Remote, Awesome Note, and more. For a limited time, they will also receive a $25 Google Play credit with the purchase of a Galaxy Note 8.0, when they register their device. The Galaxy Note 8.0 will be available in white for $399.99 MSRP. Accessories will be available beginning mid-April. These include Book Covers in white, grey, pink or green, as well as USB and HDMI adapters, and a travel charger that connect via the device's microUSB port. For multimedia content and more information, please visit www.samsung.com/us/note8.